Somerville, Mass - There has been a lot of activity in the back yard this week. A nice cardinal couple moved into the tree near the back door. We have named them Cardy-Girl (after the long-time owner and occupant of the pink house, a lady whose ghost certainly lurks in one form or another) and Daddy-O. The nest is high enough that you can't see inside, but this week it became apparent that the egg(s) had hatched. Those little peepers make quite a racket! The funny thing is that they only peep when the parents are around. Both Cardy-Girl and Daddy-O spend a lot of time and energy bringing food to the chick. (They seem to be very nice parents.) When they are away, there is no movement in the nest and all is quiet. But as soon as one of the parents announces his or her arrival, the peeping commences. I was curious about what was going on in there, so I found this on YouTube. We could actually see the chick's wide-open beak, which would pop up above the nest when one of the parents showed up. We also watched the adult male clean out the nest, as you can see in this video. I read that the nestlings would stay for 10-11 days before being coaxed out into the wide world. As it turned out, today was the big day. I was pulling out a few weeds, when I happened to glance up and notice this little fuzzball perched on a branch of the tree where the nest was. He was quiet. A few moments later, both parents arrived, chirping around and acting alarmed. The chick got excited to see his parents, and he fell from the branch. Apparently this is normal for a fledgling, who should spend another 1-2 weeks on the ground before he has the strength to fly. This is the the chick's most vulnerable time, for obvious reasons. This afternoon, I decided to work in the backyard and I had to chase off two different cats. The problem is that this guy does not stay still. If he would just stay hidden in our garden, I could make sure that the cats are not around. (We have done this before when the catbirds were nesting nearby.) But over the course of the afternoon, the fledgling made his way into the neighbor's yard, and eventually around to the front. He's easy to track, because he's such a peeper, and the parents are constantly monitoring his progress. He goes quiet when a predator approaches, or when the parents fly off to find some food. But otherwise, there is constant communication between the three of them. Anyway, that's what's happening in the pink house. It's almost as good as Botswana! #9 Hejnal - Every hour, the bugle call from the Mariacki steeple sounds across the Old Town. True, it seems sort of excessive to do it every hour. And true, I was disappointed when I learned that the legend of the Trumpeter of Krakow was invented by an American author (read about it in my previous post). But I still loved this sad, plaintive melody, which was a cause for a pause - just for a moment to observe what was going on around me. Inevitably, everyone was looking up. At home, there a painting of the Mariacki steeple (complete with bugler getting shot with an arrow) hanging in my living room. I can't hear the song, but I can remember the story. #8 Balcony over Pijarska St - Every morning in Krakow I would step out on my balcony to check the weather, drink my coffee and watch the passers-by. This became less and less appealing as the month went on and the construction on the street got closer and louder and closer and louder. At home, I have no balcony, but I do have construction on my street. 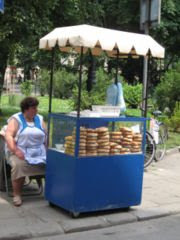 #7 Obwarzanki - I thought long and hard about which Polish food I would miss the most, and I finally came up with it. Sort of a cross between a bagel and a pretzel, this round chewy treat is topped with sesame seeds or poppy seeds and sold from street carts. At home, there are pretzels and there are bagels, but there are no obwarzanki! #6 Hidden courtyards - The Krakow Old Town is set up so that imposing building facades tower over the cobblestone streets. It feels close and crowded. But behind every building, there is a tranquil courtyard, which is unseen from the street. This is obviously prime territory for sipping a cold beer on a warm day. At home, there is a hidden courtyard right behind the pink house - the secret garden as we sometimes call it. That's pretty good too. #5 Basement bars - While we're at it, the Old Town foundations date to the 14th century, which means the basements of these buildings are ancient, evocative arcaded cellars, with brick walls and low ceilings. These places come alive by night, filling up with the sounds of jazz music and the smells of fresh-drawn beer. Come to think of it, we have a sort of basement bar in the pink house too. I think I may have a new-found appreciation for the PLE. #4 Planty - At the end of the 18th century, the administration decided to pull down the city's medieval walls which - frankly - were no longer needed to defend the city. In its place, they constructed a wall o' green - a two-mile strip of park that encircles the Old Town known as the Planty. Our flat was perched on the edge of the Planty, so this park became our preferred route to get just about anywhere, allowing us to bypass the crowds of tourists and school groups that swarmed the Old Town. At home, we live on the edge of Lincoln Park. Apparently it was once a claypit, and it's now popular amongst dog-walkers and sunbathers. 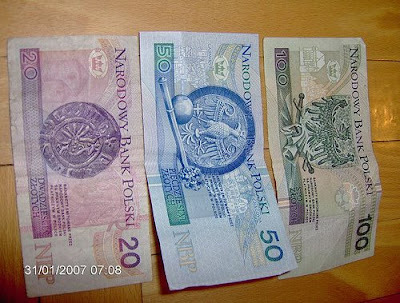 #3 Zloty - Somehow, it's always more fun to spend money when the bills come in various colours. At home it's all green. Boooring. #2 Maly Rynek - The so-called "small market" is a city square that is tucked into the Old Town, behind the Mariacki cathedral. (It provides a perfect vantage point to watch the bugler play.) It's just a few steps away from all the activity, yet it somehow manages to avoid the chaol and crowds that besiege the main market square. #1 Polish class - Twice a week we would show up for two hours of vocab tests and grammar drills. In fact, it was more like two hours of playing games and telling jokes. Our ever-patient teacher Ola insisted that we speak Polish, which meant that half the time we were laughing and the other half we were lost. Thanks to Juergen for the photos and the fun! At home, we speak only English. Sometimes that's funny too. Somerville, Mass - Krakow is plastered in posters announcing upcoming events and exhibits. In Poland, posters are not only advertisement, but art in and of themselves, often with a social or political message. Click here to see my photo gallery. Somerville, Mass - I am done. Three months and three continents later, I am back in the pink house. Back to reality, as they say. 1 - As might be expected, the yard was a mini-jungle when we returned. I was really looking forward to gettng out there and getting my hands dirty. I was dreaming about it (literally). After one long day of weeding and trimming, the garden is actually looking quite lovely. Gotta love those perennials! 2 - We hung our new Polish artwork in a pominent place in the living room, and it looks lovely too! The new addition to the Eastern European collection is a Rodzinsky, ladies and gentlemen. We made the acqaintance of the artist at an exhibit opening in Krakow and now we are proud owners of Murek (translation: little wall). 3 - I resumed my yoga practice and it feels fabulous - sore muscles and all. Have I mentioned how much I love Karma yoga studio in Cambridge? 4 - Three days after we arrived home, the mailman delivered the boxes that I sent from Africa. Very impressive timing, Mr Postman. The boxes contain bike gear, camping gear and - most importantly - my only pair of bike cleats. I was not sure how long I would have to wait before I could take the Klein Q out for a spin, but the answer is I don't have to wait at all. 5 - On the way home, we bought some Campari at Duty Free and we have started experimenting with recipes for lo spritz - with delightful results. If you recall, the spritz is the cocktail of choice in Venice - pro secco, fizzy water and bitters - and it is delish. Perfect for sipping out on the back terrace. I'm not sure why it took us a year to try this at home. 6 - The food being eaten in the pink house is unbelievable. We didn't really use our kitchen in Krakow, since my job was to review the restaurant scene. Actually, I figured out that I didn't eat home-cooked meals for three months, so now I'm making up for lost time. And my personal chef is rising to the occasion! Grilled steaks with corn on the cob, grilled shrimp over fresh lemon fettucini, grilled salmon with mango salsa and steamed asparagus, bolognese sauce over tri-colored rotini... this is making me hungry. Gotta go. Szczawnica, Poland - In case you're wondering, it's pronounced shchavnit'sa and it's a village in the Pieniny Mountains. And - in case you're wondering - the Pieniny are a picturesque range in the Carpathians in southern Poland. For our last weekend in Poland, we decided on a mountain getaway - two days of hiking, rafting and drinking mineral water with curative powers. These curative powers are not a myth. Jerry had a miserable cold when we arrived; but after a day of sweating it out in the sauna and replenishing his fluids with "St Stefan" mineral water, he was like a new person. Here is the lady who mixed up the magic potion. We chose Szczawnica because it's supposed to be less touristy than some of the better known mountain resorts in southern Poland. As we strolled down Main St, with its hotels and hokey souvenir shops and horse-drawn carriages, we had to smirk: Good thing we didn't go to the touristy place. My favorite feature was the series of flower sculptures depicting the local fauna. Click here to see my photo essay. Anyway, it really was a wonderful weekend. We went on long hikes on both days. The second one was supposed to be a short hike to see the sunrise, but we got a little "sidetracked" and it ended up being a long hike. At least we saw the sunrise. Today we are celebrating our 12th wedding anniversary, so according to tradition, we get up to see the sunrise wherever we are in the world - even if it happens at 4am. This afternoon we spent a delightful two hours floating down the Dunajec River, enjoying gorgeous views of the river gorge with the Tatra Mountains as a backdrop. The raftsman was quite a ham. He had the boat in stitches for the much of the journey. Too bad we couldn't understand what he was saying. Krakow, Poland - How time flies when you're having fun. It's hard to believe that I am in my final days in Krakow. One week from today, I will be home in the pink house. Instead of trying to write a separate post about everything I have been up to, I decided to offer a list of highlights. A greatest hits, if you will. 1 - Wawel Castle. The number one tourist attraction in Krakow (as evidenced by the hordes of school groups running around). The grounds are gorgeous, as is the magnificent Wawel Cathedral, burial place of all of Poland's most prestigious leaders. Here, you will also find the den of the dragon Smok. Legend has it that during the days of Prince Krak (the founder of Krakow), this dragon used to terrorize the town, his favorite feast being beautiful young virgins. The joke is that he starved to death. But the more traditional legend is that Prince Krak foiled him by feeding him a sheep stuffed with sulfur. That must have been some explosion! 2 - Podgorze. Formerly an independent city, this neighborhood on the south shore of the Vistula River is a gem. It is starting to attract some attention, as it is the site of Schindler's Factory, where Oskar Schindler saved the lives of so many people during WWII. A long-awaited museum is set to open in the factory this fall, which will certainly draw the tourists. But for now, Podgorze is definitely off the beaten track. To the north, it offers a wonderful panorama of Krakow. To the south, it overlooks the vast, unkempt terrain of the former Plaszow concentration camp. The Nazis destroyed the camp as they retreated, but the grounds remain mostly untouched as a memorial to the many people who died here. 3 - Nowa Huta. This massive steel works was built by the communists during the 1950s, apparently in attempt to counter Krakow's intellectual tendencies. It's about 10km east of Krakow, but it feels like a different world. Actually, it feels like Russia, with the wide avenues and socialist realist architecture. Nowa Huta was always disparaged by Krakovians, but it was here that workers' strikes and artist movements and pro-church demonstrations were most vociferous. After several attempts at destruction, the statue of Lenin was finally removed in 1989. The ultimate insult: this central square is now named after Ronald Reagan. Ouch! 4 - Camaldolese Monastery - The Camaldolese monks are renowned for being hermits. Really. Their motto is Memento Mori: "Remember you must die". And just to make sure they remember, they sleep with the skulls of their predecessors in their cells. The Camaldolese Monks live in seclusion. They pray together, but that's about it. There are five days a year that they might contact the outside world - if they wish. The monastery is open to the public, but only to males of the species. Anyway, it's rare to come into contact with a monk. You might see him praying in the church, but he probably won't talk to you. I visited the monastery on one of 12 days that it is open to women. There was one bushy-bearded monk entertaining a group of nun, but otherwise the place was pretty quiet. 5 - Auschwitz-Birkenau. It seems wrong to put these notorious camps on a list of highlights. The place is disturbing - no, distressing - but it's an essential part of Poland. As many as two million people died at this camp. Two million people. I was disappointed with the museum at Auschwitz, which tends toward gruesome photos, without a lot of factual information or analysis (at least not in English). But it's very clear about explaining what different buildings were used for, what daily life entailed for the prisoners and the many many ways in which they were killed. And really, I guess that is the point. While many people died at Auschwitz, it was primarily a concentration camp. By contrast, nearby Birkenau was a death camp, where people were herded off the trains and straight into the gas chamber. The place is vast. Most of the buildings were destroyed by the Nazis, but the grounds stretch out for miles. All that is left are the ruins of the gas chambers and crematoria, as well as a few barracks - a chilling reminder of the tragedy that took place here. There is a bike trail that follows the river all the way from Krakow to Tyniec and beyond. One sign said that it goes all the way to Budapest, but I figured that's an expedition for another day.